A leading Australian kidney specialist will take the helm at the Northern Territory’s Menzies School of Health Research (Menzies), following a six-month global search for a world-class director and health researcher. Professor Alan Cass, a senior director at Sydney’s the George Institute, was today announced as the new head of the nation’s only medical research institute with a major focus on tropical and Indigenous health. Chair of the Menzies’ Board Professor Simon Maddocks said Prof Cass was an ideal candidate: “Prof Cass has a deep understanding of Indigenous health and Indigenous communities developed through his extensive career as a kidney health researcher. 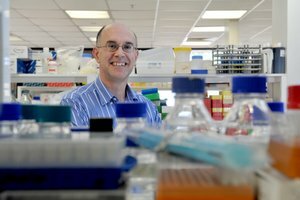 He takes an especially collaborative approach to health research, and that is of vital importance to Menzies. Prof Cass currently serves as the Director of the Renal Division at the prestigious George Institute for Global Health in Sydney. He is also a member of the Executive of the Australasian Kidney Trials Network; the President-Elect for the Australian and New Zealand Society of Nephrology; and a leading proponent of academic collaboration in clinical research in kidney disease. In 2003, Prof Cass completed a Harkness Fellowship at Harvard University in the USA. Prof Cass has authored an average of 20 academic papers per year, fuelled by a strident commitment to prevent chronic disease and advance wellbeing among Aboriginal and Torres Strait Island Australians. Furthermore, he is a Chief Investigator for the Kanyini Vascular Collaboration, which brings together researchers, health providers and communities across Australia to conduct research to improve health outcomes for Aboriginal and Torres Strait Island Australians with heart disease, diabetes and kidney disease. In addition to his expertise in Indigenous health, Prof Cass maintains a strong regional focus – most recently his work has included chronic disease and kidney disease studies in China and Malaysia. Prof Cass will relocate to Menzies’ Darwin headquarters on 12 November and on 25 October, will deliver the research school’s annual oration. The occasion will mark Prof Cass’ return to the Top End and to Menzies. Prof Cass completed his University of Sydney PhD research into the determinants of end-stage renal disease through Menzies from 1998-2002, whilst also serving as a nephrologist at Darwin Royal Hospital.